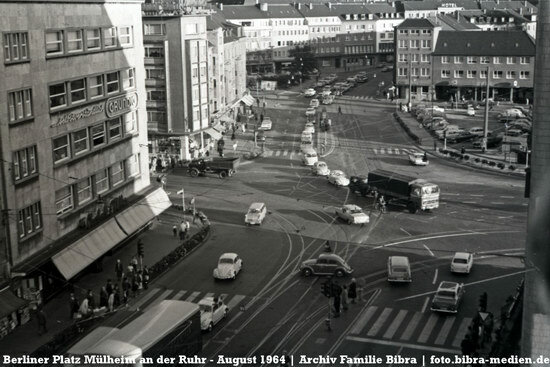 Another historic photo from our archives – this is again from August 1964 and was taken from the restaurant terrace of the Kaufhof in direction of the crossing at the Berliner Platz here in Mülheim, whose parking lot you can partially see on the upper right. The streets are positively teeming with VW beetles – see how many you can spot! More historic photos of Mülheim will come when I find them – photography was very expensive in these days and everyday views like this one were actually less interesting back then and are comparatively rare in our archives.